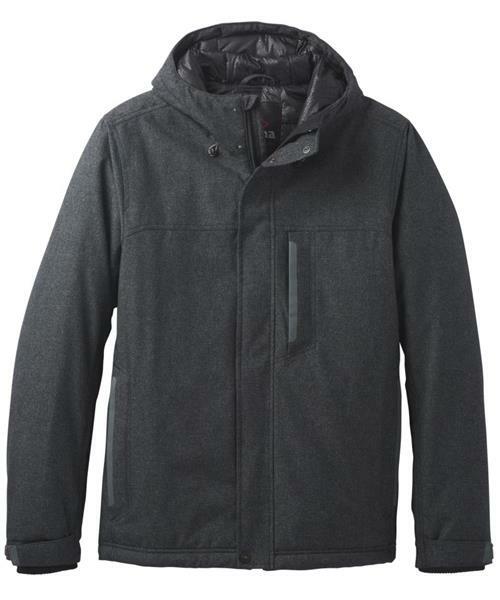 The Edgemont Jacket by prAna is made with a melange twill shell cut for a standard fit, featuring 10k/10k lamination with PFC free DWR water repellent finish, meaning it keeps you dry while allowing your skin to breathe. Increased warmth comes from 100g Primaloft ECO fill. Design features include adjustable hood with drawcord, stash pocket at the chest, interior security pocket, rib knit comfort cuffs, and a hem drawcord system.